Burning Man is a yearly event that is held in the Black Rock Desert in Nevada and gets its name from the burning of the effigy that takes place on the last Saturday night of the event. The event is usually held the last Monday of August and runs until Labor Day. This event is usually accompanied by radical self expression and is a chance for experimental community to take place. So what should you wear to Burning Man? • Shoes: First and foremost you will want to get a comfortable pair of shoes. 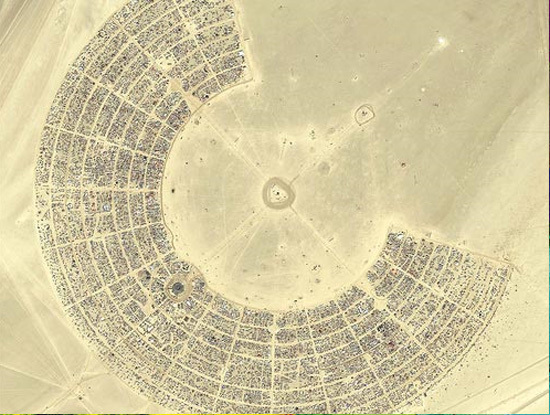 Burning Man will have you walking and walking a lot. There is what is known as playa dust all around and if your feet are not adequately covered then you can be susceptible to ‘Playa Foot’ which is a type of irritating burn. While not serious it can hinder the amount of fun you can have. You should wear either sneakers or work boots but you absolutely need to wear socks. You can also soak you feet at night to keep them fresh for the next day’s activities. • Get goggles: In the dessert a sand storm can whip up at any minute. To protect your eyes you can bring a pair of goggles. You can get the kind that fir over your glasses or get a more contemporary looking pair, but be sure your eyes are protected. • Dust masks: For the same reason you need goggles it is a good idea to have a dust mask handy. If you don’t want to use the traditional dust mask you can use any number of fun and stylish bandannas that can be worn around your neck and then used to mask your face from dust if need be. • Dress in layers: The dessert can be hot in the day and cold at night. Dressing in layers will not only add to your costume but it will also allow you to stay comfortable no matter what the temperature is. • Wear a hat: Find a fun and wild hat that you can wear that will not only add to your costume but will also help protect you from the elements. • Get colorful and creative: When it comes to Burning Man, the more color in your costume the better. Get creative and remember it is all about the art so feel free to experiment and go wild. Be sure that all of your decorations are either securely sewn onto your costume or hot glued on so that you don’t leave anything behind when you leave. Feathers are not a good idea as they can come off rather easily. When you return home from Burning Man, don’t just throw your cloths in the washing machine. They will be filled with dust and that dust will turn to mud if thrown straight into your machine. Use a leaf blower to blow out the excess dust first and then you can wash your clothing as normal.